Wilhelm Furtw�ngler was born in 1886 in Munich where his father was a lecturer at the University. In 1920 he succeeded Richard Strauss as conductor of concerts at the Berlin Opera. His next position was Music Director of the Leipzig Gewandhaus Orchestra and the Berlin Philharmonic, following in the footsteps of the great Artur Nikisch. After succeeding Felix Weingartner in 1928 as director of the Vienna Philharmonic he refused directorship of the State Opera, but in 1931 went on to become joint musical director of the Bayreuth Festival with Arturo Toscanini, where he championed the music of Wagner. When offered posts in New York and Vienna as director of Opera, he declined preferring to stay in Germany where after the Second World War he was cleared of all allegations of collaborating with the Nazis. He had notable success in Britain with the Philharmonia Orchestra in the 1950s and I remembers a concert he gave in London's Royal Festival Hall performing Beethoven's 4th and 5th Symphonies and to have seen him in the flesh, is an occasion I shall never forget! The recordings included here are of performances recorded between 1949 and 1954. The Brahms Violin Concerto with Menuhin dates from October 1949 and is taken from HMV Red Label 78's. 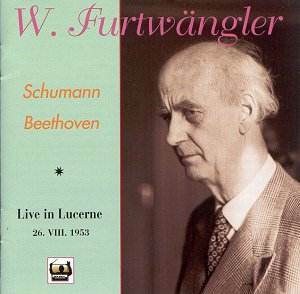 The opening allegro begins very serenely with Furtw�ngler commanding some fine playing from the Lucerne Orchestra. From his first entry Menuhin displays a wonderful sensitivity and sureness of tone that remained with this artist throughout his distinguished career. Furtw�ngler was a superb Brahms conductor and adopts a fairly broad tempo for the first movement. The slow movement marked adagio has some fine woodwind playing especially the principal oboe and again there are some exquisite passages from both soloist and orchestra. The third and final movement allegro giocoso is another example of Brahms' superb writing for violin and orchestra. The interplay between soloist and orchestra is quite magical and the pre-LP 78s from 1949 sounding quite fresh in their transfer to CD. The remainder of the disc is allocated to a performance of Schumann�s 4th Symphony which according to the notes was recorded from a broadcast by an amateur music lover. Fortunately the recording survived, as the original tapes were deleted by Swiss Radio (thank goodness for the BBC). The performance in general receives a dramatic and spirited interpretation from Furtw�ngler who again secures good playing from the Lucerne orchestra. The recording itself is indeed adequate, but with some quite audible distortion in loud passages. The second disc consists of a complete performance of Beethoven's Eroica Symphony as well as short extracts from the 7th and 9th Symphonies. The Eroica is taken from the same broadcast as the Schumann 4th in 1953 and it is interesting to make comparisons with Toscanini and the NBC Symphony Orchestra recorded by NBC in Carnegie Hall, New York on 6th December 1953. Whilst both conductors were great Beethoven interpreters, they differ quite considerably at times on matters of tempi, Furtw�ngler taking over two minutes longer in the first movement. Both conductors omit the first movement repeat. The remaining three movements are taken at a much brisker tempo by Toscanini and one is constantly reminded of the modern approach favoured by period instrument conductors in observing Beethoven's metronome markings. Nevertheless this is a wonderful account of the Eroica from a great conductor, whose clarity and inner detail of the score is beautifully achieved. The two extracts that completes the disc are both taken from live performances: the 7th in August 1951 and the 9th in August 1954. The 7th Symphony again has some fine playing but cannot quite match the beauty of tone that the Vienna Philharmonic gave to Furtw�ngler in their HMV recording. In the 'Choral' the Festival Chorus(!) is joined by the Philharmonia Orchestra whose playing in the last movement excerpt is quite staggering. Champagne days indeed! All in all then, a splendid document illustrating the art and musicianship of a very great conductor who died prematurely (for a conductor) at the age of 68. A sad loss!